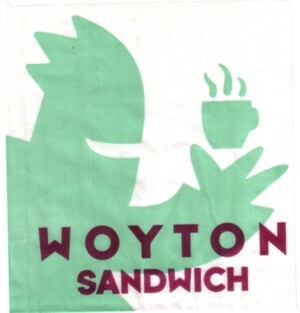 About six or seven years ago my brother-in-law, Patric, did the house style for a brand new chain of coffee shops in Germany, called Woyton. It is very much like The Coffee Company and Starbucks, but not as big yet. But they do have shops in many German towns, and whenever we visit our family in Dusseldorf, we go to one of the Woytons there. And I think that here are at least five of them in Dusseldorf alone. I was asked to make a logo for Woyton by Patric. I made a few, and one was chosen. What went wrong next, I don’t know, but for some reasons Patric and the Woyton guy got an argument over money, and I never got a cent for the logo. Now that is not something rare: I have done many jobs for which I never got paid, for all kind of reasons. But somehow this is a special case. Our children like the story and that is why we eat a lunch at Woyton every time we get the chance. The logo is literally all over Dusseldorf: everywhere on the street you find it on paper cups, bags, wraps, sugar packets, bills, it is even painted on the walls. I know that the man who designed the Star Wars logo, Jim Novak, who is also a comic letterer by the way, got 25 dollar for the logo. It is one of the most used logo’s on this planet, which he didn’t know when he made it of course, but nobody ever cared to pay him extra for the job when Star Wars became big. I have no idea what would be a fair price to pay Jim Novak ,and neither do I know what would be a fair payment for my Woyton logo, but situations like these are so ridiculous that it becomes funny. I mean, try to rip off the owners of companies like Star Wars or Woyton and you probably get sued within minutes, but they come away with ripping off other people, and they seem to loose no sleep over it at all. We were at Woyton last week; that is why I mention this. I even brought along a new paper bag, that you get when you buy a sandwich. And they serve great sandwiches! 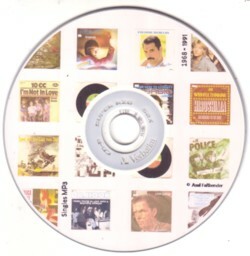 While we were in Dusseldorf, my other brother-in-law, Axel, gave me a CD with mp3’s of all of his 168 45’s that he owns. His taste is far from mine, but I do appreciate gifts like these, and I like to listen to this music knowing that Axel loves all these songs. That helps to listen to music with new ears. The 168 songs are mainly love songs that were big hits in the eighties, and that I always hear whenever I listen to Sky Radio. A nice exception is Axel’s scratchy copy “Rock your baby” by george McCrae. It is one of the best records made in the seventies, and I don’t think it is on the Sky Radio menu. The copy that Axel recorded seems to be used as adoormat, so I will give him a better copy of this 45 next Christmas. This is one of the many 45’s that you can still buy for half an euro at any place where they sell second hand records.